Super Robot Chogokin Giant Robo THE ANIMATION Version by Bandai – Available from HobbyLink Japan. It is one of the terrible facts of fandom that, by the time he died in 2004 following a fire at his home, Yokoyama Mitsuteru had rather dropped from the public consciousness even if his work had not. This was certainly the case when, in 2001, I began frequenting a little cafe in Toshima, Tokyo where I was doing research on my doctoral thesis at the time. As I have said elsewhere, this was one of those serendipitous, surreal moments which have made up my life: as it transpired that this old lad was in fact the chain smoking Yokoyama Mitsuteru himself and seemed happy to hear me waxing geekical about the virtues of his own creations, and about the importance of the fighting robots genres in general. Yeah… Dumb is not the word for it. Surprisingly though, it was a good way to begin something of a friendship, the short course of which taught me a few important things about the way in which media often eclipses its creators if they are not careful. * Tetsujin 28 & Giant Robo are credited with being the foundations of the modern mecha, with creators such as Kawamori Shoji citing these works as being essential to the development of Macross, Gundam and all we hold dear today. * Kagemaru of Iga and Red Mask began not only the modern ninja boom, in general – perhaps even more so than the films of the period – but led directly to the creation of current fan favourite Naruto. * On top of the that, he was also responsible for defining much of the ‘magical girl‘ genre, especially in the series Sally the Witch, which – by his own admission – lifted much of its foundation directly from the US TV sitcom, Bewitched. * Finally, his work on series like the Three Kingdoms manga stirred up a real interest in historical works which continues to this day. It is sad then that, when interviewing younger fans about their tastes in anime and manga, the vast majority knew at least one Yokoyama series, if only as it fell within the sort of material they liked to consume, but could tell me nothing – sometimes not even the name – of the man who had created these magnificent works. He did not seem to mind this at all, however. People were buying his work (which remains in print to this day), his peers recognized his contribution to the whole, and without much of an ego to inflate, he really did seem to be content to watch and see how far younger creators could take his own faltering thoughts as time went by. I like to think that, if fate had not taken him from us in 2004, he would have had as much love for things like Macross Delta as he had for Mazinger Z, as he never seemed to lose the ability to look forward from one project to the next, and the ideas which drove his professional rationale. When he created Tetsujin 28, he was exploring the notion of technology as not an ‘evil’, partly as a way of demonstrating to a generation of children growing up in a post-war environment that they were not entirely powerless as their situation might imply (though all cultures develop such archetypes in media for children) but also, and more darkly, that such technology was essentially neutral. Indeed, during the run of the comic and the series, the antagonists gain control of Tetsujin 28 a number of times, wreaking terrible damage on society before control of the magic box is wrested from them. Tetsujin 28 was just a radio controlled toy, with no more say in its own affairs than a toy car. This fact automatically suggested a sequel of sorts to Yokoyama, which would ultimately become Giant Robo. 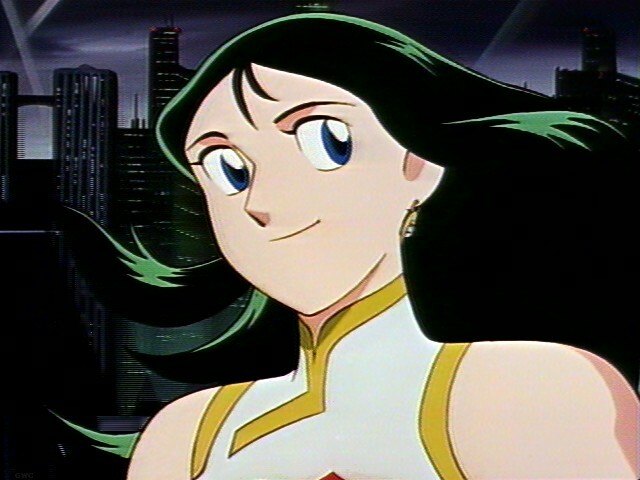 When, in 1990, Yasuhito Yamaki contracted Imagawa Yasuhiro to create a new version of Giant Robo, the production was stalled from the very outset by the fact that a number of different, Japanese and US, agencies claimed ownership of the trademarks/copyrights on the Giant Robo series proper. The reasons are not important. What does matter is that, rather than let the matter rest, Imagawa, having established that he could use the actual robot itself (for reasons which pass my understanding), went directly to Yokoyama. He explained the situation and, as a fan to a master, pleaded the case for the creation of a ‘paean to Yokoyama’s work’. An amused Yokoyama thought the idea insane enough but freely gave his assent and handed over creative use of ALL the characters and series which remained in his hands for this portmanteau of an OAV. As a result we have Giant Robots, Big Fire, the IPO, heroes from the Water Margins, Super Spies, ninja and all manner of things which, on the surface should not work at all. When discussing with Master Yokoyama why I liked the show so much and why folks in Japan seemed so attached to it, his answer was linked to his laconic view of his own lack of place in his work. People knew the tropes and the characters and when they were blended together they still had that nostalgic resonance for which older fans seek and from which younger ones draw their own sense of understanding. Its popularity in the West certainly touches on this. Together! Allegiance or Death. BIG FIRE! A small gripe here… It is obvious that, owing to the size of the toy (and possibly cost) not all the missile pods represented in the series could be represented in the toy. However, it is clear that, as with other examples in the series, compromise is the real key to Super Robot Damashii series. It still amazes me what is possible within the restricted scope of these ‘mini chogokin’ and I cannot say that this gripe is a deal breaker. If they miss these packs off any Soul of Chogokin version, however… Well. Simple and straight forward. Colors are good, seams are tight, and on the toy I received there are very few mold/paint issues, and none of note. Standard poly, interchangeable hands as one might expect, including one dedicated to bracing Robo’s massive cannon. Speaking of which, here is how the engine/gun/missile pod breaks down. Out of the box and in the raw, and looking ready for action! CRUSH THEM NOW, Dr. ROBO!